Friday 5th April and Team Ards Camera Club travelled to Bangor to support its members who had entries in the 2019 NIPA Novice Competition. The Competition was hosted by Bangor & North Down Camera Club and was well attended in appreciation of the quality images on display from the Novices. Recent years have produced much success for the fledgling photographers from ACC and this year was no exception. In the Colour Print Section, Claire Russell achieved 2nd Place with ‘Yellow Petal Points’ and Highly Commended was achieved by Sarah Shaw with ‘Armoured Lady’ and Edward Graden with ‘Spring Tide Ballintoy’, in the Mono Print Section, Sean Evans achieved Commended for ‘Caroline by Night’ and in the PDI Section, Claire Russell was again successful by achieving 3rd Place with ‘Playing with Fire’. Congratulations to Claire, Sarah, Sean and Edward who all have worked very hard to reach the standard to compete at the top of competition with the best of the Novices from other clubs and very well done to the other entrants who as the Judges pointed out, had images that were very close to the top ten in each section. Also, thanks and well done to the Judges, Anita Kirkpatrick, Chelle McGaughey and Darren Brown who provided a good balance of critique and advice for improvement on the images referred to during the evening. As for the travelling members of ACC, they were as ‘quiet and understated’ as usual, but as always, gave great support and encouragement to their club Novices. Friday 29th March and Ards Camera Club’s Programme of guest presenters concluded with a visit from Ossie Bruce. Ossie is a much-travelled member of CPA Camera Club and aptly named his presentation ‘Home and Away, Out and About’. First on display was a variety of images to introduce his journey into photography and this was followed with others showing aspects of experimentation as Ossie honed his skills. An interesting aspect was the detail of the settings used to achieve the required outcome of the work on display. Next was a comprehensive selection of images taken to document journeys to the Rockies in Canada, a Club trip to Iceland and a semi working holiday to India. A superb display was presented of the natural beauty of Canada and Iceland together with many images of the social deprivation and work to assist children in India. Like many photographers, Ossie is a regular visitor to the Annual Photography Show in Birmingham and to give members a flavour of the event he gave a ‘photographic’ account of aspects of this year’s show. To finish, Ossie returned to Iceland and showed a film recorded on the ‘dash cam’ of his car as he drove through the snow and ice during his tour of the landscapes that so captivate the many visitors to this beautiful country. Many thanks to Ossie for such an engaging and comprehensive presentation of his photography that was very much appreciated by everyone. Friday 22nd February 2019 and Ards Camera Club’s Programme continued with the NIPA Round 5 Competition in the theme of Photojournalism. The guest judge was Matthew Canning from BPIC who had the unenviable task of taking on a themed round for his first visit to the Club. A contentious topic given that many suggested that the photographs needed an ‘Editorial type Title’ to identify the content as being journalistically newsworthy. Many topics were on display including sport, personalities, music, road traffic accidents, protests, air land and sea rescues, documentary, environmental, street disorder, firework displays and of course the Bank Buildings going up in flames. Quite a task for Matthew to pass comment on those he deemed not applicable and pass judgment on those he deemed to have fulfilled the requirements of Photojournalism. Those members who had images placed were Richard Cowan, Marlene Hazelhurst, Linda Hutchinson, Patricia Mackey, Keith Malcolm, Robert McKeown, Adam Middleton, Neal Ritchie, Claire Russell, Sarah Shaw, Liz Tullett and David Williamson. Adjudication of Round 5 will take place at CPA Camera Club on Saturday 27th March 2019. Many thanks to Matthew who gave a comprehensive critique on each image that was both encouraging and advisory to the authors. Thanks also to Competition Secretary David Williamson for all his hard work and well done to everyone who entered the Competition and especially well done to those members who were successful in having their images placed. Friday 15th February and due to a rearrangement of the scheduled event in our programme, Robert Sergant of CPA kindly offered his services to provide a presentation of Light Painting. An overview of the basics that included an explanation of the methodology, information on the mainly ‘homemade’ equipment and various images of the intended outcome was followed with a practical session when various aspects were attempted, notwithstanding the limitations of the low ceiling height of the premises. With the assembled partaking members lined up, tripods and cameras at the ready, the fun commenced with the attempted photography of many creations involving light wands, a cycle wheel adorned with LED lights, spinning globes, illuminated plexiglass paddles, electroluminescent wire and of course the various volunteered models. Many great images were produced and a lot of fun was had by this very entertaining genre of photography. Very many thanks to Robert who put a lot of thought and physical effort into providing the Club with such an enjoyable and entertaining evening and ‘enlightening’ everyone on the endless possibilities to pursue in this aspect of photography. Friday 8th February was a very special night in the Club’s Programme. The date coincided with the annual presentation (or lecture as he would prefer to call it) and the 95th Birthday of our acclaimed member Sinclair Adair. A night to celebrate his Birthday and be entertained with his inimitable Audio-Visual delights. David S Adair (Sinclair) ARPS, AFIAP, AIPF, APAGB, PSA to give him his full title was born this day in 1924. His interest in photography commenced circa 1950 when he started helping part time in the photographic section of a chemist/photographic shop on the Shankill Road, Belfast. The work ‘developed’ until he was running the photography side of the shop and his ultimate buy-out led to him opening his own business circa 1965, aptly named the 'Foto Studio'. Meanwhile, Sinclair was avidly pursuing his photography and in 1963 achieved AFIAP and in 1965 ARPS. In subsequent years he also achieved AIPF, APAGB and PSA. Sinclair liked to compete and during the 1960s and 70s achieved much success and acclaim in International Salons. At club level his services were much in demand as a judge and lecturer and he was frequently consulted and subcontracted by some of the leading professional photographers of the day for his renowned dark room skills. In the mid 1970s, the 'troubles' forced the closure of his studio and Sinclair relocated to live in Bangor where he continued his photography and fast developing interest in Audio Visuals (AVs), first at Bangor Camera Club and subsequently at Ards Camera Club. During his first ten years at Ards Camera Club he ran a beginner’s class and tutored many who are still members and are now passing on their knowledge and experience to others. The arrival of the digital age opened a new chapter in Sinclair's photography as he applied the new technology to his creative imagination and dark room wizardry to produce AVs which gave him competitive success and provided much laughter, entertainment and inspiration to all who watched them. 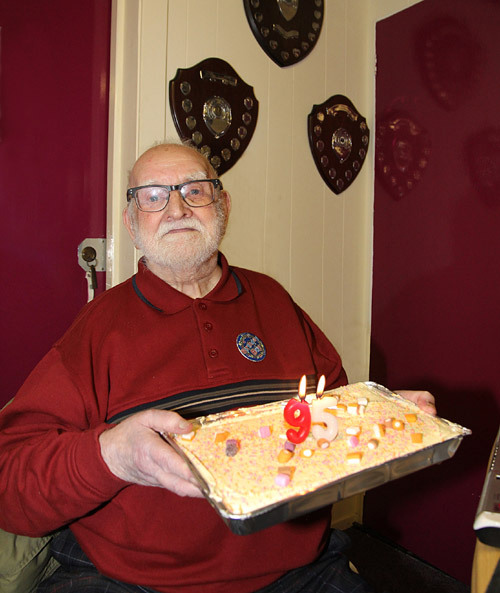 Now at the age of 95 Sinclair is still an active club member and supporter of NIPA events. Always one of the highlights of our year is the presentation of Sinclair’s AVs and this was no exception, with many yet unseen masterpieces on display with a few slightly adjusted repeats included for good measure. As usual, there was a mix of topics covered including the usual idiosyncratic look at Royalty, Religion, Country and Western, USA, Character Doubles, Fruit and Veg Portraiture, Trains Across London and Journeys Through the Cosmos. There was a break during the presentation to let the membership catch its breath and celebrate with the obligatory Birthday Cake that such an occasion demands. The Chair outlined Sinclair’s career, mostly as previously noted, and expressed the Club’s Best Wishes as he celebrated his Birthday. A big thank you to Sinclair, his unique style provided a night of much mirth, the usual humorous exchanges with the audience and above all, entertainment and inspiration that was appreciated by everyone. Wednesday 23rd January 2019 and Ards Camera Club’s Programme continued with the NIPA Round 4 Open Category Competition. The guest judge was Darren Brown from Bangor and North Down Camera Club, accompanied by his curly haired minders. As usual with an open round of competition there was a great diversity of topics including Landscape, Sport, Portraiture, Drone, Nature and a new topic for the club with the inclusion of some Infrared. The standard as expected was very high, especially from the General Section where some members are now producing excellent work that is frequently being successful in competition. Those members who had images placed were Richard Cowan, Robert Graham, Marlene Hazelhurst, Sian Kerr, Keith Malcolm, Ted McKee, Ryan Patterson, Brian Powell, Claire Russell, Sarah Shaw and David Williamson. Images from the members whose names are highlighted will go forward to The NIPA Round 4 Adjudication at Enniskillen Camera Club on Saturday 2nd March 2019. Many thanks to Darren who gave a comprehensive critique on each image, including many encouraging and constructive words of advice. The usual exchanges with the membership who always express much wit and wisdom on such occasions was well controlled by Darren who was also appreciative of the abundance of dog minding attention given to his entourage. Thanks also to Competition Secretary David Williamson who collects in and organises all the entries for display. Well done to everyone who entered the competition and especially well done to those members who had images placed. Friday 25th January 2019 and Ards Camera Club facilitated NIPA for the Round 3 Adjudication on the theme of Book and Song Titles. There was a large attendance at the Londonderry Pavilion with all seats taken and many standing, to see the varied and very creative entries for this round of competition. A very interesting theme and a challenge for the judges to consider the technical quality of the images in conjunction with the assigned titles. Well done to all the successful authors from the many participating clubs. At the conclusion of this NIPA Round 3 Competition, Ards Camera Club is still in overall Third Place, just half a point behind Christian Brothers Camera Club in Second Place. Many thanks to the Ards Club members who helped to transport and erect the display stands and for the help to provide refreshments during the interval. Friday 18th January 2019 and Ards Camera Club’s Programme continued with a visit from Hibernia Landscapes by Stephen Wallace. Hibernia is the ‘old’ name for the Island of Ireland and although most of the images on display were landscapes from our very picturesque Island, there were also images from a recent visit to the Faroe Islands. In a move from the traditional landscape orientation, most of the images on view were in portrait orientation which made for a very interesting perspective on the land, sea and sky that surrounds us. Images from the North Antrim coast, the Wild Atlantic Way, Rathlin Island, and the Faroe Islands provided the source for most of the coastal seascapes, while Donegal, Lough Neagh, the six Ulster Counties and especially the Mourne Mountains provided the source for the inland landscapes. Stephen provided an explanation of the ‘where, when and how’ for the creation of each image together with details on how he plans for each photographic trip. There were references to maps and various phone apps to ensure that the light generated by sunrise or sunset was directed where required to achieve the intended illumination of the composition. Such was the quality of the landscapes captured in the Mourne Mountains that it was no surprise when Stephen displayed an image that had won the public vote for UK Mountain Photograph of the Year 2017. Many thanks to Stephen Wallace for a most entertaining and informative presentation of seascapes and landscapes that are so prevalent and readily available to be photographed, right on our doorstep. Friday 4th January 2019 and Ards Camera Club returned to action after the undoubted excesses and hopefully joys of the Festive Season with the NIPA Round 3 Competition in the Theme of Book and Song Titles. Guest Judge for the event was Brian Maguire from BPIC who had the unenviable task of judging images from a technical photographic viewpoint together with the application of an associated title which may or may not have been immediately obvious. As the evening progressed, it became apparent that there was a very diverse range of litary and music tastes within the membership of the Club. Also, there was some very creative thinking in applying titles to images or images to titles; cryptic, strange, humorous, obvious, devious, amazing, unbelievable, imaginative are some adjectives that spring to mind. However, following all the oh’s, ah’s, laughs and much head scratching (and that was only the Judge) decisions were reached and results declared. The following had placings in the various categories on display - Claire Russell, Jacqui Agnew, Keith Malcolm, Linda Hutchinson, Liz Tullett, Marlene Hazelhurst, Martin Conroy, Patricia Mackey, Rusty Adair, Sean Evans, Sian Kerr and Ted McKee. Well done to those successful members, especially Marlene Hazelhurst who had five images placed. Many thanks are accorded to Brian who both expertly judged the images and kept control of the usual ‘occasionally vocal but always very appreciative’ audience. Also, many thanks to Competition Secretary David Williamson who had the task of collating all the entries with the added complication of checking the applied titles. Adjudication of this NIPA Round 3 Competition will take place on Friday 25th January at the Londonderry Pavilion, Portaferry Road, Newtownards with viewing from 7.00pm and commencing at 7.30pm. Friday 14th December was Christmas Dinner Night for Ards Camera Club at the Chef & Manager Restaurant N’Ards with nothing to report, except that there was great food, ‘some’ drink, lots of craic as always and a good time was had by all. So, Merry Christmas and a Happy New Year to all who follow the photographic fun at Ards Camera Club. Friday 7th December and Ards Camera Club hosted the Roy Finlay Memorial Natural History Competition at the Londonderry Pavilion, Newtownards. Apologies for the late report, but for various reasons, the scribe was unavailable as are still any copies of images to post of the placed entries. However, as always, the quality of the entries was of an excellent standard and there were 84 prints and 145 PDIs on display for this NIPA Competition run by Ards Camera Club. The judge this year was Nigel Snell from Bangor & North Down Camera Club, a previous winner and regular competitor, so well qualified to peruse the entries and select the top images. Also present was Neil Finlay, who on behalf of the family is providing continued support for this Competition in memory of his late Father. In the Prints Section, Hugh Wilkinson of Catchlight Camera Club had double success with 1st Place for ‘Redpolls Squabble’ and 2nd Place for ‘Robin with Catch’. In 3rd Place was Brendan Hinds of Christian Brothers Camera Club with ‘Yellow Spotted Side Necked Turtle’. Highly Commended Certificates were awarded to Ross McKelvey and Brendan Hinds and Commended Certificates to Lionel Mitchell, Vittorio Silvestri and Hugh Wilkinson. In the PDI Section, 1st Place went to Chris Miller of Merville N’Abbey Photographic Club with ‘Cape Fox Cub’, 2nd Place to Hugh Wilkinson with ‘Redpoll and Coaltit’ and 3rd Place to Terry Hanna of Ballynahinch Camera Club with ‘Back in a bit’. Highly Commended Certificates were awarded to Vivienne Beck, Brendan Hinds, Brian Larkin, Valerie McKee, Ross McKelvey and Hugh Wilkinson. Commended Certificates were awarded to Aine Carberry, Jonathan Clark, Rosaline Hughes, Brian Larkin, Robert Sergeant and Pamela Wilson. The accolade of Overall Winner went to Hugh Wilkinson for his print ‘Redpolls Squabble’ and the trophy of a sculpted glass Goldfinch was presented to him by Neil Finlay. Irvine Ferguson, Chair of Ards Camera Club, congratulated Hugh Wilkinson and Chris Millar for their 1st Placings, together with the other successful entrants. Also, a vote of thanks was expressed to everyone who had helped in any way in the running of the Roy Finlay Memorial Natural History Competition 2018. Friday 30th November and Ards Camera Club’s Programme of events continued with a further invasion from Bangor. Darren Brown was the guest presenter and as usual, was accompanied by his minders ‘the Curly Girls’. Visits to Scotland, along with details on preparing for any trip was on the agenda. Darren had prepared a programme that covered his many trips to the west side of Scotland and in particular Glencoe and Skye. The vagaries of the Scottish weather provided an interesting perspective, as images of the same or similar places were displayed throughout the various years of Darren’s visits. No sterner critic of his work than Darren himself, as he showed images that he considered not up to his current standards, although many of the club members would have been proud to have produced work of a similar quality. A few of the members have both family and holiday connections with Scotland which created an air of geographical exchange as locations and place names were discussed. There was a varied show of mainly landscapes on display, some instantly recognisable, but many off the beaten track. Also, the more recent visits had a great variety of long exposures, along with some very striking infrared images. Oh, and naturally there were also a few dog poses. Many thanks to Darren for a very entertaining and engaging evening, with a suburb display of Scottish landscapes and many tips on the where, when and how to plan for such trips. Friday 23rd November and the guest presenter at Ards Camera Club was Judith Kimber who showed the members everything there was to know about the Audio Visual (AV) medium of photography with its associated addition of music and commentary. Being a music teacher by profession, it was reasonable to expect a creative input for music, however Judith also writes the story and adds her own commentary as necessary for each production. Four productions were displayed with something for all interests, including romance, motoring and a day by the seaside. There was a love story set in an imaginary town in Ireland, a real love story set between Ireland and America, an outing to Brighton and a tour of an American car graveyard. The photography in both monochrome and colour was styled to suit the individual AVs, the music was mostly composed and played by Judith and the stories and commentaries were also written by Judith. As for the credits, the photography was shot on location in USA, Brighton UK, Folk & Transport Museum and Ulster American Folk Park in N. Ireland, Music, Script, Production and Direction all by Judith Kimber. Many thanks to Judith for providing an insight into producing AVs, all delivered in a most humorous and very entertaining manner. Friday 2nd November and Ards Camera Club Programme of Events continued with the first of its members’ nights. Club member Ryan Patterson, the proprietor of Earth & Sky Media, gave a presentation of his ‘drone photography’. Already one of the club’s prominent photographers on ‘terra firma’ with many competition successes, Ryan demonstrated his aerial photography and videography skills with a complete ‘overview’ of his drone activities. All of the technicalities and regulations involved in running this type of operation were explained, together with details on controlling the drone as the images and videos were captured. Images were displayed showing compositions taken from directly above, to those taken at various angles, 360degree composites and videos from various locations home and away. There was also a flying simulator available for demonstration purposes, but only Keith Malcolm was brave enough to try (could be good for getting closer to the Milky Way!). Altogether a superb presentation of a totally different aspect of photography. Many thanks to Ryan for this detailed look at the world from so many angles, most of which were from a great height above ground level. Onwards and upwards (in competition rather than drone terms) as Competition Secretary David Williamson revealed that Ards Camera Club were placed First in the Annual Quadrangle PDI Competition between ourselves, Corby CC from England, Wrexham CC from Wales and Hamilton CC from Scotland. Congratulations and especially well done to those members whose images were chosen to represent the Club in this competition and many thanks to David for coordinating the event. Wednesday 24th October and instead of the usual practical night, Ards Camera Club selected its images for the NIPA Round 2 Open Competition. Guest judge for the evening was Vittorio Silvestri who stepped in at the last minute for the unwell Darren Brown to whom we send best wishes for a speedy recovery. As usual, there was a substantial entry list for all categories and being open, a vast array of subject matter to be judged. With great strength across the club, the following fourteen members had images placed in the top four over all categories:- Marlene Hazelhurst, Sarah Shaw, Jacqueline Agnew, Bobby Graham, Ryan Patterson, Irvine Ferguson, Sian Kerr, Claire Russell, Linda Hutchinson, Eddie Graden, Richard Cowan, Keith Malcolm, Patricia Mackey and Ted McKee. To emphasise the spread of quality on show, ten of the above placed members had images selected to go through to the NIPA Adjudication. Well done to everyone who entered and especially well done to those who had images placed. Vittorio as usual gave a master class in judging, with a balanced critique that included praise, encouragement and tips for improvement where necessary, as well as controlling the occasionally vociferous but always appreciative audience. Many thanks to Vittorio who completed the mammoth task of judging such a large number of entries almost within the scheduled time. A random selection of some of the entered images is on our Facebook page. Friday 26th October and Team ACC travelled to Banbridge for the NIPA Round 1 Open Competition Adjudication. The club got off to a great start in this first round of NIPA competitions with a solid score of 104 points that gave a placing of third overall. Congratulations and well done to Ted McKee whose image of ‘Kingfisher in the Drizzle’ achieved star rating with a score of 14 points. Thanks to all who travelled in support of their club and well done to the entrants who all scored highly to produce such a good opening result. Also, thanks to David our Competition Secretary for all his hard work over both rounds of NIPA competition. Friday 19th October and Ards Camera Club continued its programme of events with a visit from Simon Mills who presented a selection of his assignments as project photographer on overseas consular trips to enhance the craft work and marketing skills of the locals in rural areas. On show, was video and still photography of both his contracted and personal work in the Atlas Mountains of Morocco, Vietnam, Myanmar, Mali and ‘Ballymena’. The projects included photographs of local habitat and people as they were introduced to methods of enhancing and organising existing design fabrication and involvement in cooperatives for Fairtrade arrangements. The overseas photography included many aspects of carpet weaving, fabric dying and ceramics. Closer to home, as noted above, Simon showed a video of the complete process of the traditional craft of spade making, turf digging with said spade, converting the turf to charcoal and art work using the charcoal. Many thanks to Simon for a very entertaining and educating evening of travel and documentary video and travel photography to some very unexpected destinations. 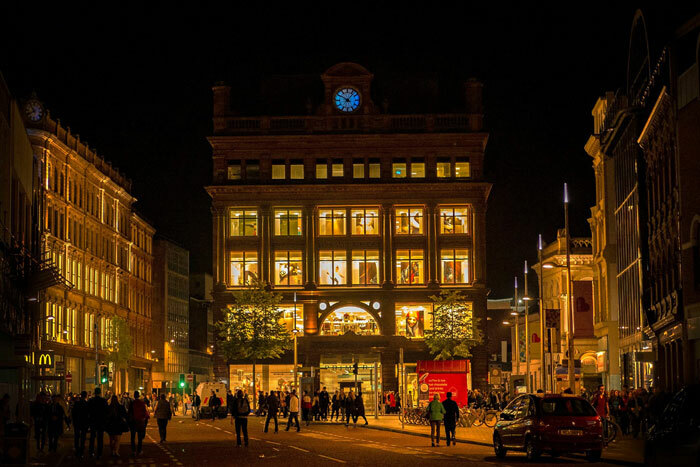 On a different subject, I was in Belfast today for the first time since the sad fiery demise of the Bank Buildings and it occurred to me that I had a photograph of the building taken on Culture Night a few years ago. Copy below, not exactly competition standard, but a reminder of the building in its former grandeur. Friday 12th October and Ards Camera Club hosted its leg of judging for the Annual Quadrangle Competition. For those new to this event, the Quadrangle is a Projected Digital Image competition between Ards CC, Corby CC from England, Wrexham CC from Wales and Hamilton CC from Scotland. Each club provides the other three with a set of 15 PDIs and the collective 60 images are scored by a guest judge at each club and the aggregate scores for each set of 15 decides the winner. Ards are the current champions and as usual entered a strong set of images in an effort to retain its title. Guest judge was Paul Hanley who had the unenviable task of scrutinising 60 images and then providing a critique of each in support of his given score. As this is an open competition, there were various categories on display such as, portraiture, landscape, nature, street, architecture and travel. Paul provided clear, concise and balanced critiques, with many tips on simple improvements that could have enhanced the scores of some entries. A great learning exercise for both novice and advanced club members. Obviously, the overall result will not be known until all the clubs have carried out their judging exercise. So, watch this space and the placings will be announced as soon as available. Meanwhile, to illustrate the high standard of the entries, some images selected from each club are on our Facebook page. Many thanks to Paul for doing such a sterling job in judging the competition and imparting his expertise by way of praise, encouragement and tips for improvement. Also, congratulations and well done to NIPA for being the overall winner of the Celtic Challenge Competition held today in the Strangford Arms Hotel. Friday 5th October and Ross McKelvey of Catchlight CC was guest presenter at ACC (abbreviations from now on to avoid RSI) to enlighten us with a talk entitled ‘Images and Insights into Competitions’. With some initial technical difficulties sorted, Ross commenced his presentation with an overview of the requirements of the main bodies who provide for and oversee competitions and accreditations at home and abroad. Requirements for the RPS, PAGB and IPF, to name the most recognisable bodies for local photographers, together with various other salons and overseas bodies were detailed. Ross noted that LRPS was his first accreditation and showed the actual panel that he had successfully presented for consideration. On the question of choice of mount colour, Ross gave a visual demonstration of how the eye can be deceived when the same colours, set adjacent to each other, can look different due to the effect on them of other surrounding colours! A demonstration of constructing a composite image on Photoshop followed, with all the best shortcuts applied to make the process look easy. Not so easy to most in the audience without a lot of practise and reference to further instruction! The evening concluded with an overview of a selection of Ross’s images both old and some so new that they have yet to be displayed at their intended competitions. Many thanks to Ross for a very informative and entertaining evening as he gave an insight into his undoubted talent and success in the world of competitive photography. Also, great to see Sinclair Adair back at the Club following his absence due to a fall. We wish him well as he continues to fully recover. Apologies to all you regular readers for no weekend report, but the scribe had neither time or access to a key board until tonight. Friday 28th September and a full house at Ards Camera Club were treated to an evening of Astro Photography with a bit of Landscape for good measure, all provided by Tyler Collins. The evening got off to a loud cheer when it was revealed that club member Keith Malcolm was Tyler’s primary school teacher in a slightly earlier era. So, with pupil turned teacher, Tyler proceeded to educate everyone about the art of photographing the stars and the Arora with lots of images taken home and away. Most were amazed that with the right conditions, the Arora is very visible from the North West coast of Ireland and Tyler illustrated this with many photographs taken from the Antrim coast right through to Malin Head in Donegal. However, most would agree that the best and most detailed images were taken in Iceland where Tyler spend some time as an Arora guide and now regularly runs workshops there. Apart from his Astro work for which he is best known, Tyler is also very keen on Landscape Photography and the evening concluded with a display of images taken mostly in Ireland and Scotland. Many thanks to Tyler for this presentation of superb images, each provided with a detailed explanation of location, camera settings and all the other necessary requirements to achieve the finished product. Friday 21st September concluded a very busy week of competition for Ards Camera Club. Wednesday 19th and the Club selected the fifteen images for the Annual Quadrangle PDI Competition with Corby Camera Club in England, Wrexham Camera Club in Wales and Hamilton Camera Club in Scotland and on Friday 21st the images were selected for the First Round NIPA Open Competition. However, going back a week to Friday 14th and the Club welcomed Hugh Russell from Christian Brothers Camera Club to give a presentation on Photojournalism. Although this subject is the final themed round of NIPA Competition in February 2019 it was deemed prudent to examine the topic at the earliest opportunity. Hugh has a wealth of experience working as a photojournalist and provided a very informative and entertaining evening showing examples of his profession together with the stories of how and why the images were taken. Many thanks to Hugh for his presentation which hopefully has imparted to members what is required from them between now and the competition. Wednesday 19th and the mammoth task of reducing 93 images down to the required 15 for the Quadrangle Competition produced a very intense night of observation, voting and collating of scores. Fortunately, Competition Coordinator David Williamson is a wizz with spreadsheets and just like election night on TV, the scores were added live on the big screen for all to watch in anticipation of the 15 being decided. Many thanks to David for organising everything and to Sian Kerr who helped input the scores. As this competition has yet to take place, names and titles of images will be noted at a later date. Friday 21st and it was the occasion of NIPA Round 1 Open Competition with Guest Judge Terry McCreesh from Catchlight Camera Club in attendance. Catchlight are the current World Club Champions, so with such a pedigree, the bar was set high for the expected judgement of the images on show. Terry provided a very constructive and informative critique of every image which gave both encouragement and useful direction for the entrants in both Advance and General categories. A big thank you to Terry for undertaking such a demanding task and well done to everyone who entered images in the competition, especially those listed below who were placed. A selection of the images entered in both the Quadrangle and NIPA Competition are displayed on our Facebook page. Also, a wish for a speedy recovery to our venerable member Sinclair Adair who unfortunately suffered a fall recently and is currently confined to barracks. Graham Mackey provided a wonderful card for Sinclair at Friday’s Meeting and this will be delivered at the earliest opportunity. Friday 7th September and the first night of Ards Camera Club's guest presentations of the 2018-19 Season. A full attendance got great value with two guests rather than the usual one. Louise Borbely and Robert Sargeant jointly gave a very detailed account of their journeys to achieving PAGB (Photographic Alliance of Great Britain) accreditation. Robert explained about the necessary PAGB requirements and how he methodically selected, consulted, prepared and prepared again his images over a period of almost a year. Louise took a somewhat different route by making her own personal selection and only completing her preparation at the last moment. However, both approaches proved successful and the evening concluded with a presentation of both their sets of quality images. Well done to both Louise and Robert for their PAGB achievements and many thanks for sharing their successful journey with the Club. Also, a big thank you to Ards Shopping Centre for continuing to facilitate two panels of photographs for the Club and for their endorsement of the refreshed images that were put in place last week. There will be an overview of the main programme as well as information on our more informal, practical based Wednesday evening programme and information on how to enter the club and NIPA competitions. The Club, with its own clubhouse and facilities, welcomes photographers of all levels to join its thriving membership. Renowned for providing a supportive environment, full of laughs, whilst also securing a number of top results in competition, the club is a wonderful place to develop your skills.